Average council tax bills in England will increase by 4.5% a year from April, reaching more than £1,800 in some regions, research suggests. 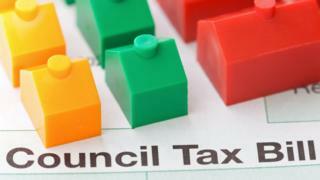 The Local Government Association said cuts had left councils “little choice”. The council plans to pump more money into children’s services and adult social care, the Local Democracy Reporting Service said. Rob Whiteman, chief executive of Cipfa, said the increase was a reflection of the “incredible” financial pressures faced by local authorities and the police. “Local authorities have faced the most significant cuts to spending over the last ten years,” Mr Whiteman said. Councillor Richard Watts from the Local Government Association said councils had lost “60p out of every £1” the Government had provided for services since 2010. “Faced with such funding pressures, many councils feel they have little choice but to ask residents to pay more council tax again this year to help them try to protect their local services,” he said. A spokesman for the Ministry of Housing, Communities and Local Government (MHCLG) said: “Councils, not central government, are responsible for managing their own resources. Taxpayers in Scotland meanwhile, will see bills rise up to 4.79%.